Inspired by the popular post “The State of Glenwood South”, I decided to hit Fayetteville St. and break down “North Carolina’s Main Street”. With the weather warming up, there has been more activity on the sidewalks and restaurants are serving it up outside. Also, I’ve noticed a jump in nightlife and weekend activity this year as compared to last. There is still a bit of a problem; a significant amount of places are not supporting downtown traffic at night and the weekend hours. Here is a block by block summary. 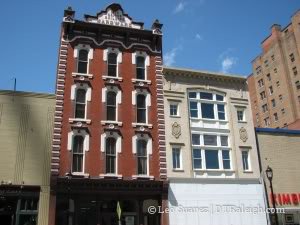 The 100 block of Fayetteville St. offers a random assortment of shops for pedestrians. You can park here, get your eyes checked, plan a trip to that exotic country you’ve always wanted to go to, and all with a coffee in hand. The work week keeps this block alive, with lunch traffic and the Alexander Square parking deck full to the brim. But when rush hour traffic dies down, this block mostly closes shop. Crema is a great place to for some food and coffee with the best hours here, open everyday. Café Carolina and America’s Pita Grille have yet to experiment with night and weekend hours. The Justice Building, Court of Appeals building, and Wachovia tower eat up a lot of space too, offering nothing to those walking by. We are now getting into the meat of Fayetteville St and its 200 block is shaping into something really exciting. So far The Big Easy, The Mint, and Port City Java are open close to everyday. If you still have not been to the Raleigh City Museum, take the time and get out there. There is plenty of room for more and there are two renovation projects currently underway. Thank you for contacting the CVS/pharmacy website. I am in receipt of your e-mail regarding the store hours at our Raleigh, NC CVS/Pharmacy. I am forwarding your comments to James Barefoot, the District Manager. He will review this with his staff at their next meeting. We appreciate the time you have taken to share your comments with us. This was three months ago and I see no changes. Come on CVS, get with the times. This block is improving and showing growth. 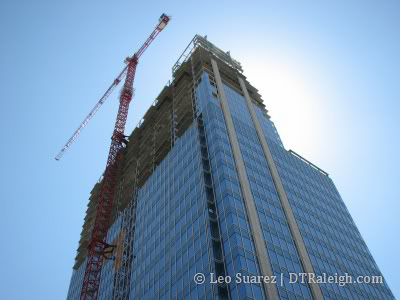 The 300 block is the tallest block in Raleigh all thanks to RBC Plaza. This building offers a lot of ground floor retail space and will hopefully be occupied when the building switches on later this year. The 300 block is also the brightest block with the ABC news station on the ground floor of The Hudson. Sono and Yancy’s also add to the activity inside. The weekday work crowd will always own this block because on the opposite side of the street, the courthouse and post office are buzzing during the work week only. On nights and weekends, you get a one-sided view with lights and activity on one side and closed up buildings on the other. This block has shown the most growth. Right now, Fayetteville St. ends here as we wait for the Marriott Hotel to open and then it will continue to Lenoir St. This block supplies a lot of visitor traffic from the Sheraton. Chick Fil A offers weekday lunch and the Sheraton also has a restaurant and bar inside. 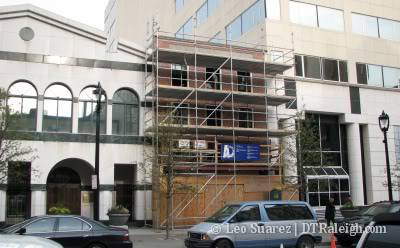 City Plaza will hopefully save this block from being voted most boring block in downtown. The barber and flower shop are in a very small building on prime land. I would not be surprised if this small parcel along with some of Progress Energy’s land behind it is razed for something tall but that is just my prediction. 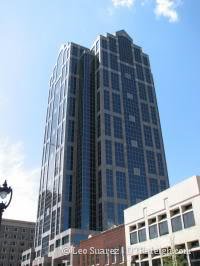 Besides the NC Opera Company moving here, there has been little change. We’ll just have to wait and see what happens throughout the year. This block has shown no real change. So there it is, covered fully from end to end. To sum it up shortly, I think the government buildings are an obstacle to downtown growth and pedestrian activity. Still, Fayetteville St. is growing, slowly, and going through a painful process to get away from the 9-5, Monday to Friday scene that it has become so accustomed to for over 30 years. Let me add one more obstacle to Fayetteville Street’s quicker come back: Salisbury and Wilmington Streets. The city leaders – most of them, at least – demonstrated an obsession with Fayetteville Street, which is understandable. However, without connecting our “main street” with other areas, any effort to revive Fayetteville Street would take a long time, no matter how solid the course of action. 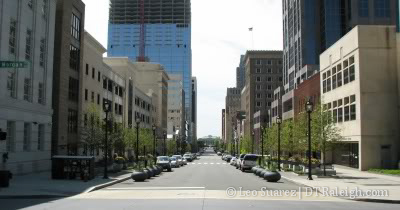 In my opinion, there was no easy way of dealing with the resurrection of Fayetteville Street, but I would have loved to see a plan that included all the aforementioned streets. That way, vendors would be able to have more options and a long-term vision would be in place. Everything outside Fayetteville Street seems more random (i.e. Fins) and we cannot expect these businesses to do well without a good plan in place. Projects like The Edison and Charter Square will definitely help, but we are at least 4 years away from that point. Iatria is going to close the downtown location and they were open for only 3 years :( We need the retail, but we also need the residents to support it. Fayetteville Street needs, IMHO, more useful retail. Maybe some upscale clothing and a major bookstore chain would help. The very top photo (buildings closest to that structure they call the capital building), remove those ugly buildings! Build 40-50 story buildings in their place that have retail and character (that side of F Street is dead and ugly, no foot traffic AT ALL! 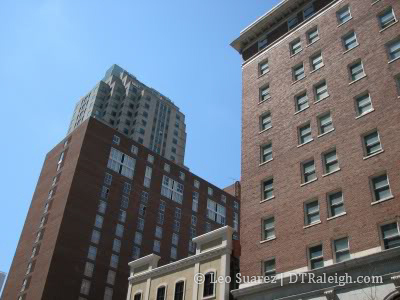 Again, downtown Raleigh IS TOO SLOW TO DEVELOP, let’s bring in some outside developers who will do it RIGHT! I think that things are going relatively well overall on F-Street. Another issue that I have currently is that the RBC construction is really killing the walking traffic flow on the 300-200 block intersections. Right now I feel it is as time to be patient as we wait for RBC\RCC\Mariot to open. This will open up the sidewalks, allow people to come to F-Street after shows at Memorial, bring new residents, bring a large number of convention goers, and more. All of this is what I believe is holding back development. “Retail follows Rooftops” or in this case just flat numbers hopefully. Also, can I get the CVS contact info? I’d love to send them a note and pass it around the building to try and encourage them to stretch the hours a bit! My ideal would be M-F open til 8 and Saturday and sunday open til 5. I agree with TheKitch – the construction makes walking impossible! On Friday I ate dinner at Poole’s, then walked to the ballet. Up McDowell, across Fayetteville on Davie, then back down Wilmington to Raleigh Memorial. All the other sidewalks were closed! Yes, growing pains for sure. I cannot wait for more sidewalk space to open up so I can make new walking routes. I contacted CVS through their “Contact Us” link on their website. Kitch, let me know if you want to organize something and let them know what is up. You forgot to mention the Fayetteville Street Tavern at #112 F’ St. It’s about the only sign of life on the west side of that block. And, with outdoor seating, it’s kind of fun, too. The wait staff has always been very pleasant, and it’s a good place for American pub grub. I highly recommend it.